Cameras | WorstPlans.com updates every Monday! Improve the odds of finding a lost pet with this over-engineered license-plate-based system! The ultimate computer vision project for a machine learning startup. “Lost cat” and “lost dog” signs are often placed up on telephone poles (Fig. 1), but it’s unlikely that a specific person who sees a lost pet will also have seen the sign (or even know that the pet is actually lost in the first place). Fig. 1: A person who sees this sign will know to be on the lookout for a lost snake, but the chances of seeing both the snake AND the poster are quite low. Car owners can add a camera to their car (see license plate example in Figure 2) that constantly scans for unidentified animals. This requires no effort on the part of the driver. The camera saves snapshots and GPS coordinates for every animal it sees, and uploads these to a “Find a Lost Pet” web site. Many of these animals are probably not lost, or even pets! Anyone with a lost pet can post the details of their lost animal and a reward to the “Find a Lost Pet” site. Ideal information would include a photo, approximate location, and the owner’s contact information. Once the “Find a Lost Pet” image analysis system detects a match between an uploaded image and a lost pet, a “bounty” is issued for the recovery of that pet, and nearby drivers are notified. Finally, assuming the animal is safely returned in the same number of pieces that it was expected to be in (generally this number is “one”), the bounty is split three ways: the web site, camera owner, and animal-recoverer all get a fraction of the total reward. This aligns everyone’s incentives and encourages people to install pet-scanning cameras in the hope of a payout. Fig. 2: This license plate camera is a “dog-scanner” camera that is constantly on the lookout for unidentified potentially-lost animals. Backup cameras like this already exist, so producing the hardware for this system would be relatively straightforward. PROS: This system will help find lost pets, and definitely won’t be repurposed to create a totalitarian police state. CONS: Not especially useful in finding burrowed or aquatic animals, so try not to lose one of those. Revolutionary new “lens-free camera” created in a garage by a crazy inventor—now all your vacation photos will be PERFECT! When people go on vacation, 99% of their pictures are of sunsets and monuments that have been photographed thousands of times before. Sure, that image of a majestic tropical bird perched in front of a waterfall may seem like one-in-a-million shot, but that still means that one hundred variants of it have already been uploaded to Google Photos. It can be a lot of work to frame a shot in an aesthetically-pleasing fashion. But what if we could make use of THE INTERNET to save us the trouble? Instead of carrying a regular camera, a user can carry a “camera” without a lens or ability to take pictures. The “camera” records the user’s GPS coordinates, the time of day, and the current orientation of the camera. Later, the “camera” syncs this information to the Internet and downloads the most aesthetically-pleasing photo for the specified site and time of day. So if you were disappointed that you were taking photos of Niagara Falls while it was overcast, no worries: the camera will pick out some majestic waterfall-and-rainbows-on-a-sunny-day photos from online. Fig. 2: Internally, the camera is really just searching for the top-rated image at a given set of coordinate / orientation / time-of-day. Stop futzing with shutter speed, exposure, framing, and who knows what else—just let the Internet take your photos for you! CONS: At least one person will still have to use a real camera to take photos, or else there won’t be anything for the GPS-only camera to find. Five underrated facts about dystopian totalitarian surveillance regimes! You’ll never believe fact #2! The optimal tradeoff between privacy and security is a topic that is endlessly debated. In the past, omnipresent surveillance was not feasible—but technology is now at the point where implementation of a 1984-esque surveillance state is actually possible. On the one hand, it would be theoretically convenient to have immediate response to crimes and/or injuries, and perhaps take action to prevent some crimes before they even occur. On the other hand, you might be sent to a faraway gulag because you opposed the interests of a politically-connected individual. The problem here, of course, is the human element (see Figure 1). Fig. 1: This guy (right) can monitor every aspect of your life on the video screens (left). This works fine until you become successful and he blackmails you! But if an all-seeing computer system (like Skynet in the Terminator series) were in charge of things, we could could theoretically know that the surveillance system could not be misused, and would only be used for the programmed-in purposes (e.g., catching kidnappers and insane murderers). Humans would write the rules for the system, but the raw data would (somehow) be inaccessible except to the analysis computer (Fig. 2). If a car was used in a felony, check traffic cameras for its license plate number. If a person has purchased explosive-manufacture-related chemicals, check their records for unusual activity and potentially flag them for further investigation by actual humans. If a person declared no taxable income, but drives around in an 80,000 dollar car, check them for tax fraud. Since these rules could be set by the legislature, they could be transparent and subject to review by the voters. If a person supports an opposing political party, make sure to harass and imprison them. If a person is a member of a disfavored ethnic or religious group, make sure to hold them to the strictest letter of the law. Otherwise, don’t enforce any rules at all. These informal enforcement rules might be less likely to survive if they had to be explicitly coded up and put on the official registry of surveillance rules. Or perhaps they would remain, and just be enforced with horrific robotic precision! Fig 2: This robot is totally trustworthy with your personal data, and has no ulterior motives or desires of its own (unlike a human). Fig 3: This unblinking “panopticon” eye will be a useful symbol to let you know you are in a safe and trustworthy robot-surveilled region! Stick one of these in your bedroom and bathroom to remind you that a robot is watching you at all times. When you lobby for omnipresent surveillance, make sure to imagine the predicable scenario where some irrationally angry neighbor or ambitious business rival now has a recording of every stupid thing you (and your friends/family) have ever done! PROS: Would probably reduce many types of crime. Never drop your camera again, although honestly who even has a camera anymore now that cell phones have good cameras. Pretend this post is from a while ago. The original shape of a film camera was dictated by the physical constraints of film and lenses. However, digital cameras have maintained the same unwieldy and awkward layout of film cameras, even though there is no longer a reason for a camera to be shaped in such a way. In fact, the asymmetrical “grip the camera on the right side, and awkwardly push the shutter on the top of the camera” must lead to thousands of dropped and lost cameras every year. Fig 1: A simplified camera. BLUE: “active” elements (controls on left, a focusing ring on right). RED: shutter button. Fig 2: A simplified handgun. BLUE: hammer. RED: trigger. Let’s compare the way in which a hand holds a camera vs. a handgun. Fig 3: Grip comparison. In the handgun example (left), note that at least three fingers grip the gun at all times. Additionally, the hand is held in a roughly neutral position, which makes it easy to point at the intended target. In the camera example (right), a one-handed grip results in three fingers awkwardly gripping against the thumb (in blue). Assuming that the camera is held in the right hand (which is where the shutter button is on virtually all cameras), the camera’s center of gravity means that it wants to fall down and to the left. 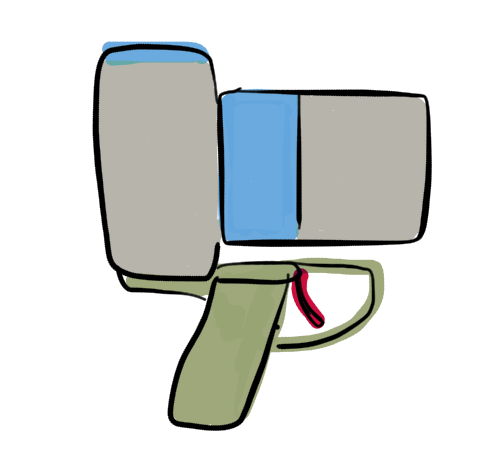 Cameras should be designed for one-handed operation with a pistol-style grip. Although it is possible to buy aftermarket pistol-grip adapters for professional cameras, they are large and either 1) do not have a shutter trigger or 2) need to be specially interfaced to the shutter button, which makes them incompatible with consumer-grade cameras. Fig 4: Proposed camera design, allowing a secure grip and easy one-handed aiming and operation. As an additional benefit, the grip could be placed slightly forward of the camera body, thus allowing the center of gravity of the entire camera + lens assembly to be directly over the grip (rather than forward from the grip, as you would get with an aftermarket pistol grip). PROS: Reduces the chance of dropping a camera. Makes aiming much easier. CONS: Admittedly, the grip would significantly increase the size of the current crop of extremely thin point-and-shoot cameras. But it would be perfect for the “prosumer” market.